The cairn commemorates Major Mitchell who passed through the area in 1836. 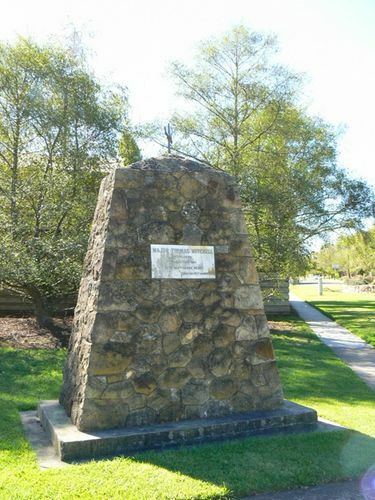 The cairn was unveiled during the centenary celebrations in 1937. HAMILTON, Monday. - About 7,000 people saw the pageant procession through Hamilton streets today, the final day of a week of centenary celebrations. The pageant included-aborigines, Major Mitchell and his party, a genuine Cobb coach (with occupants in costume), mounted police of the goldrush days, and many floats and tableaux arranged by business firms. The Hamilton Fire Brigade had arranged displays illustrating its development since the first official brigade was formed in 1870. An aerial display was a feature of the carnival at the showgrounds. Mr. Felix Mueller leaped from a plane and fell 1,000ft, before pulling the cord of his parachute. He landed safely just outside the grounds. This morning the Acting Premier (Mr. Old) unveiled a memorial cairn to commemorate the visit of Major Mitchell 100 years ago. A photograph of Major Mitchell was presented to the town by his grandson through Mr A. H. F. Lord, vice president of the centenary committee. The Argus (Melbourne), 16 March 1937.